A few years ago, I received a call from the owner of a London-based cleaning business needing help. One of its clients had invested thousands on a renovation which included new bathrooms; they had commissioned a fairly unique vein cut marble which had been mechanically polished to a high sheen. The cost of the marble and installation was around £10,000. Starting at the top of the walls, one of the cleaners applied a spray detergent and left it to run down the face of the brown-toned marble. The detergent was a general-purpose kitchen and bathroom cleaner, designed to remove limescale and dirt. On a marble-effect porcelain or ceramic surface, this probably wouldn’t have caused too much of an issue. But because the product was highly acidic, contact with the delicate polished marble caused etching and irreversible damage to the whole of the wall surface. 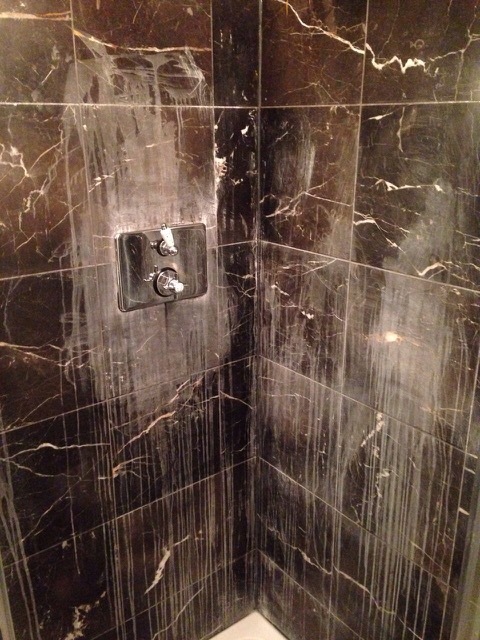 In some instances, an attempt could have been made to re-burnish the marble, to polish out the damage, but the amount of water needed and the size of the bathroom ruled this out. The huge improvement in digital print technology has, in many ways, compounded this problem. Tile manufacturers have become incredibly good at copying natural materials like marble. As a result, some people might not recognise an authentic material or realise that it needs to be treated differently. Multiple surface finishes may then be maintained with the same general purpose ‘tough on grime’ product, rather than a more gentle pH neutral detergent that would provide a safer – and just as effective - solution. At the property in London, the insurers are still trying to decide who’s responsible and who should pay for the damage caused. It materialised that the marble suppliers didn’t offer any maintenance advice at the point of sale and the installers didn’t give any guidance on aftercare. The architects who commissioned the marble for the client didn’t specify a sealer or provide any care advice - and the cleaners couldn’t have been expected to know the difference between a glazed engineered tile and polished marble. If the correct advice had been given at anystage, the damage might not have happened. Shockingly, the cleaner that caused the damage cost just 64p. A concentrated, specialist neutral detergent probably wouldn’t have cost any more, per wash. As awful as this sorry story is, it serves as a good example; it’s also worth offering that best practice advice, no matter how prickly the customer might be.